A hilarious, fresh, and decidedly irreverent look at an age old topic, Rated P provides all the wistful joy of childrearing …at a fraction of the cost of braces! A cast of four actors takes the audience through the ups and downs of childrearing – from the sublime to the ridiculous – in a series of comic and musical vignettes in under 90 minutes. I went with my Mom, Dad, and sister to see this (they were all visiting from Philly and CA). We all LOVED it. My parents loved it because it was funny and I'm sure they saw it through a different perspective (having raised three children who are all now adults and on their own). I loved it because I remember having gone through a few of those scenarios! It was great to see it on stage and to laugh out it. It almost makes me feel like we all have something in common because I'm sure everyone in the audience could relate to it in some way. The music is AWESOME, I was laughing until tearing during some of the songs. I think it was an hour and a half and there must have been over 20 songs! Really great and affordable. I'm going to take my friends. A great evening's entertainment! Well cast, well executed. The universally shared experience of parenting - told with creativity, humor,and some emotion, in a "short story" series of vignettes. The cast had great voices as well; a bonus! Very funny. My face hurt from smiling and laughing for the entire 90 minutes. Memories. This excellent play will bring back a flood of great memories. You'll laugh, smile maybe cry and be amazed at the memories the play lets you re-live. Great play, energetic cast of 4 in a wide variety of changing roles. We saw it with our adult kids and we all loved it! Go see it with your adult kids. We are from out of state and experience 3-4 plays per year. This has been the most enjoyable one in 2011-12. My husband and I got half price tickets at the TKTS booth over the holiday weekend. I didn't know what I was getting myself into. I had an amazing time, and my husband loved it too. Very funny, great cast and I cried more than once. The songs were terrific! I will make my children go on Mother's day. 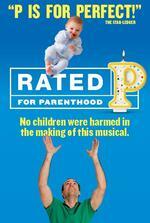 Rated P For Parenthood is a 90-minute off-broadway musical where four actors act out a series of humorous "short clips" that in some way relate to parenthood. For example, two parents attempt to answer the "where do babies come from" question, or show what it's like to drop your child off at college. I went to see the show with my parents. It wasn't as painful to sit through as more traditional broadway shows (Guys & Dolls, Billy Elliot, etc), although there was some singing and dancing. My parents really enjoyed the show. Not having kids of my own, I didn't have the luxury of looking back at past moments. Saw this in NJ, my wife is friends of one of the actors. It was hilarious. So much funnier than the typical Broadway musical comedy. Great show! A really great cast, amazing voices. The show is really funny, but by the end I teared up. Highly recommended! This show had me laughing from the opening scene...great storyline, great acting and voices and great music! Everyone can relate to the real life scenarios about growing up-loved the text "autocorrects" during scene changes! GO SEE IT!! LOVED IT!!! So funny and entertaining. We were laughing ang singing songs from the show when we left the theatre.